CHICAGO (June 16, 2016) – Light heavyweights star Andrzej Fonfara and hard-hitting Joe Smith Jr. went face-to-face for the first time Thursday at the final press conference before they enter the ring Saturday, June 18 on Premier Boxing Champions on NBC from UIC Pavilion in Chicago. Televised coverage begins at 8:30 p.m. ET/5:30 p.m. PT and features a world title rematch between Juan Carlos Payano and Rau’shee Warren plus rising star Erickson Lubin battles Mexico’s Daniel Sandoval. PBC coverage switched to NBCSN at 11 p.m. ET/8 p.m. PT and will see unbeaten middleweights Hugo Centeno Jr. and Maciej Sulecki square-off. Tickets for the live event, which is promoted by Warriors Boxing and Star Boxing, are priced at $201, $101, $61 and $41, not including applicable service charges, and are on sale now. To charge by phone with a major credit card, call Ticketmaster at (800) 745-3000 or UIC Pavilion Box Office at (312) 413-5740. Tickets are also available atwww.ticketmaster.com or by visiting the UIC Pavilion Box Office (Thursday or Friday9:00 a.m. – 4:00 p.m.). “I want to thank everyone who brought this show to Chicago. I’m ready. We’ve had a very long camp. I’ve had great sparring after traveling two weeks in Big Bear and three weeks in Houston. The rest of our camp was in Chicago and it was outstanding. “I’m ready for this opportunity. Joe Smith is a young guy who is here to beat me. I have to show him I’m a better fighter in the ring. What we say now doesn’t matter, we’ll see everything on Saturday night. “I’ve been in a lot of fights, I’ve been the favorite and I’ve been the underdog. I know this is a big fight for Joe Smith and that he’s trained very hard. He is going to be very motivated but I will be too and I will be ready on fight night. “Each fight is different. I can’t give him a lot of space to punch. I want to wear him down and finish him. I’m taking it round-by-round to get the win. “I’m very excited for this fight and opportunity. I’m here to prove myself to all those who think I shouldn’t be here. I’m taking the victory home. I want to prove it to the world. 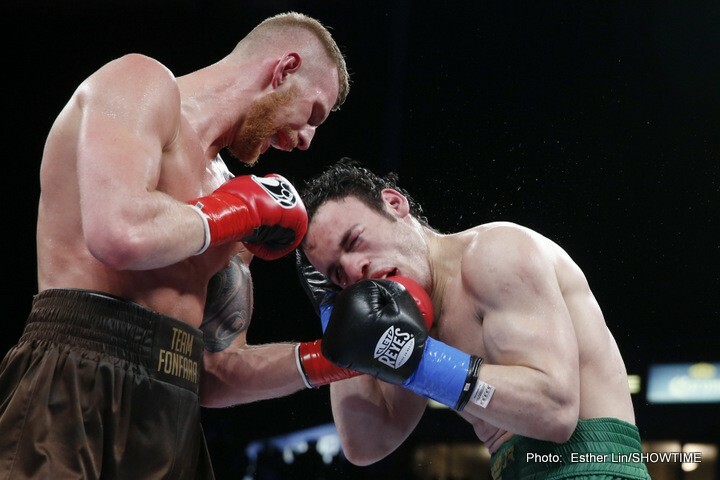 “I’m amped up to get in the ring with a high quality fighter like Andrzej Fonfara and put on a show. “Our styles are going to make for an exciting fight. I expect a war, but I’m prepared for anything. All I know is, I’m going to end the night with my hand raised. “I have come very well prepared. I knew that Raushee was a tremendous fighter before our first fight and I’m looking forward to the rematch. “I’ve had a great camp and I’m thinking very positively. I know at the end of the night I will have my hand raised in victory. “I know Warren has to say that he thinks he won the fight and maybe he really does think that. It doesn’t affect me. That’s the reality of it. He can keep saying it, but it doesn’t matter. “When I won the fight, I knew there would be some controversy. He was whining the second the fight ended. I’ll give him 10 rematches and it won’t change the result. There aren’t many elite 118-pounders out there, so who knows, we may fight again after this. “I had a whole year to train to get ready for this. I want to let everyone know that I’m coming to take the title. I’m not playing around. “I doubt it’s going 12 rounds. I want Payano to know that. I’m going out to get what I deserve. I feel like I won it the first time and I’m coming to take it home. “I want to give my condolences to everyone who lost loved ones in the Orlando shootings. Orlando is my hometown and I’m dedicating this fight to them. “It’s an honor to be on a card of this magnitude, there are a lot of great fighters here and it motivates me very much to be on this stage. “I appreciate being here in Chicago. It’s a great opportunity and a great fight. We’re weeding out the middleweights and making it to the top. It’s the best fighting the best. “I’m very happy to fight in Chicago in front of all the Polish fans. I’m in very good shape. I’ve worked very hard with my coach and I’m ready. Previous boxing news: Dreaming big: could Jason Quigley be a future foe for Golovkin, Canelo?